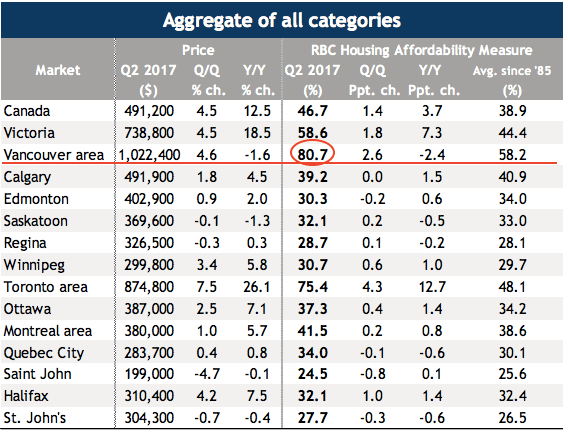 RBC released it’s latest housing affordability report. 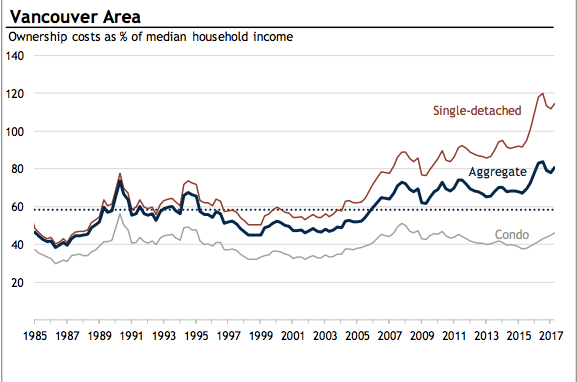 To little surprise, Canadian Real Estate remains vastly unaffordable for the masses. After back to back declines, Vancouver’s affordability or rather unaffordability metric ticked upwards once again. The RBC Housing Affordability Measures show the proportion of median pre-tax household income that would be required to service the cost of mortgage payments (principal and interest), property taxes, and utilities based on the average market price for a particular segment of the market. The affordability measures are based on a 25% down payment, and a 25-year mortgage loan at a five-year fixed rate. As per the graph, Vancouver condos require 46.2% of one’s pre tax income. While it requires an impossible 114.6% of your pre tax income to for a detached home. Keep in mind, this is assuming a 25% down payment which from my experience most buyers don’t have today. Vancouver remains the most unaffordable housing market across Canada, by a long shot. Requiring a staggering 80.7% of one’s pre tax income for the typical home.